Process Explorer is a popular application put out by Microsoft that provides many more details regarding running processes than the standard Task Manager. It has a lot more control over how the processes are organized, and it has won the hearts of many power users out there. 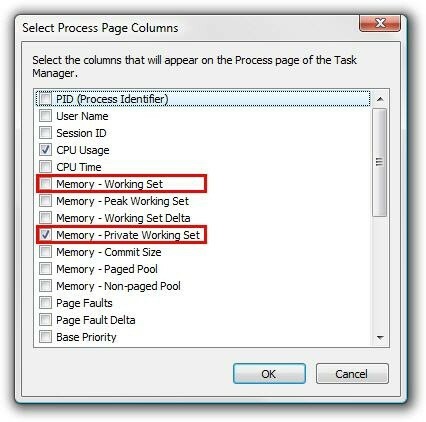 We’ve already shown you how to replace the Task Manager with Process Explorer, and now we want to answer a highly asked question of our readers: how do you display memory usage in Process Explorer? By default Process Explorer doesn’t show any memory usage information, but before we get into that we need to clarify what the two main types of memory usage are. There are two main types of memory usage: working set and private working set. 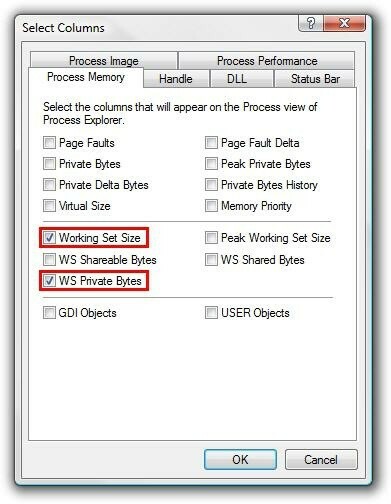 The private working set is the amount of memory used by a process that cannot be shared among other processes, while working set includes the memory shared by other processes. That may sound confusing, so let’s try to simplify it a bit. Lets pretend that there are two kids who are coloring, and both of the kids have 5 of their own crayons. They decide to share some of their crayons so that they have more colors to choose from. When each child is asked how many crayons they used, both of them said they used 7 crayons, because they each shared 2 of their crayons. Working Set: This includes all of the shared crayons, so the total would be 14. Private Working Set: This includes only the crayons that each child owns, and doesn’t reflect how many were actually used in each picture. The total is therefore 10. This is a really good comparison to how memory is measured. Many applications reuse code that you already have on your system, because in the end it helps reduce the overall memory consumption. If you are viewing the working set memory usage you might get confused because all of your running processes might actually add up to more than the amount of RAM you have installed, which is the same problem we had with the crayon metaphor above. Naturally the working set will always be larger than the private working set. In Windows Vista you can customize which type of memory usage is shown in the Task Manager (Shift+Ctrl+Esc), which by default shows the private working set memory usage. To change this you can go to View -> Select Columns, and then tick what you want to display: Memory – Working Set and/or Memory – Private Working Set. 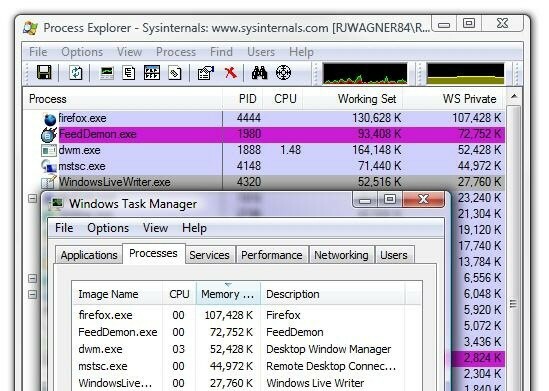 Process Explorer, which can be setup to replace the Task Manager, doesn’t show any memory usage stats by default. They can be enabled by going to View -> Select Columns -> Process Memory, and then ticking Working Set Size and/or WS Private Bytes. The WS Private Bytes is what the Windows Task Manager uses by default in Vista, and it’s what you’ll want to use if you want it to show similar stats.